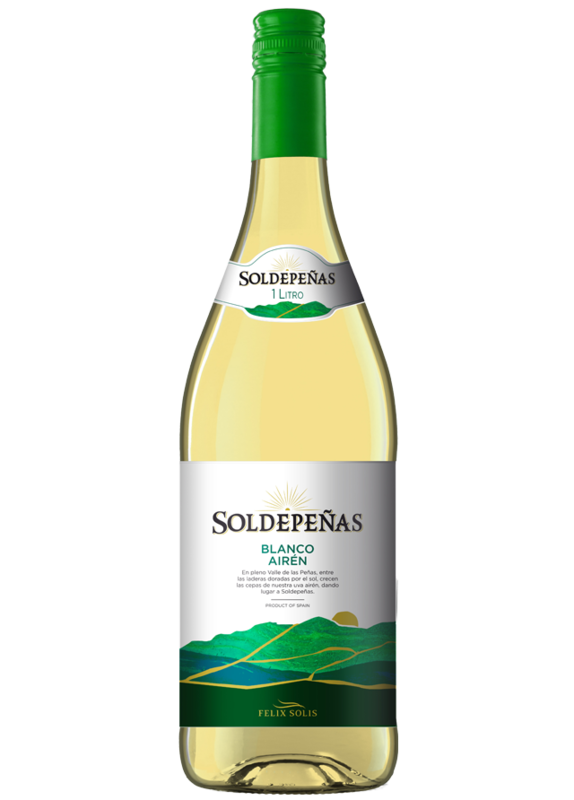 White Soldepeñas takes its name of the place where it is made: the sunny Valley of the Stones, old name of Valdepeñas, the valley of the river Jabalon. The wine is made from Airen, the indigenous grape from Castilla-La Mancha. The area of Castilla-La Mancha, located in the central plateau of the Iberian Peninsula, is the world’s largest vineyard. Varietal wines are made with one type of grape. Airen and Tempranillo are the most characteristic grapes from this area, while other non-native grape varieties sucha as Cabernet Sauvignon, Syrah, Merlot, Viura, Sauvignon Blanc and Chardonnay have excellent results due to the climate and terrain in this region. Lemon colour with fruity notes that turn lively and fresh on the palate. It is ideal to accompany fish, salads and creams. The grapes undergo strict controls on the vineyards to determine the correct moment to be harvested and transformed into a wine with the right amount of sugar and acidity. Fermentation takes place at 14-16º C and the result is a fruity and elegant wine.